Our exclusive formulation, when used as directed, provides one million colony forming units (CFUs) of live probiotic microorganisms per drop. In addition, each drop delivers 1.25 mg of vitamin C (ascorbic acid), together with chelated iron equivalent to .08 mg Fe. Research has shown that feeding vitamin C along with probiotics improved fish health to a greater extent than resulted from probiotics alone. Separate studies have shown that iron in small amounts is an essential trace mineral in the diet of fishes, required for the formation of hemoglobin, for example. Some aquarium manufacturers have added probiotic organisms to their food recipes in response to new research. However, the heat necessary for processing pelleted and flaked foods destroys living probiotic microorganisms. No research has been done that would suggest the dead organisms are as effective as living ones in improving fish health, stimulating the immune system and boosting growth rates. Aqualife’s formula creates a shelf-stable product that maintains beneficial probiotics in their natural, living state. Aqualife Bio-Pro Plus is intended for use as a food supplement for addition to all types of dry and frozen aquarium foods. Alternatively, the product can be added directly to the aquarium, where the living probiotic microorganisms help to balance the aquarium microbiome. Use Aqualife Bio-Pro Plus whenever a Vitamin C or iron supplement is required. When used as a tank additive, an 8-ounce bottle treats approximately 1000 gallons. The product is safe, when used according to directions, for all aquarium organisms, both freshwater and marine. Bio-Pro Plus is safe for use in reef aquariums. The product is stable at room temperature for one year. Diluted product or treated food should be refrigerated and used within three days in order to maintain effectiveness. Directions: Shake well. Apply a few drops to food or use combined with AquaLife Amino-Glow as a soak solution for freeze dried foods. During disease treatment add 5ml per 40 gallons of aquarium water once a day for 5 days. For disease prevention add (5ml =1 capful) per 10 gallons of aquarium water weekly. Store in a cool, dry place. For aquarium use only. 6oz. treats up to 1421 gallons. 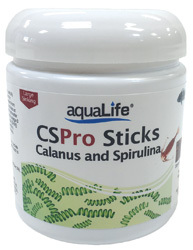 Ingredients: Purified water, live probiotic microorganisms, vitamin C, chelated iron. Contains all-natural ingredients with no harmful additives, preservatives or dyes. Available in 2oz, 6oz, and 16oz sizes.